In addition to having a spate of restaurants serving “Grandma style” cooking, Bangkok is also seeing a blossoming of brunch restaurants. The trend has been a bit longer in the making, but the rate of new openings seems to be increasing. 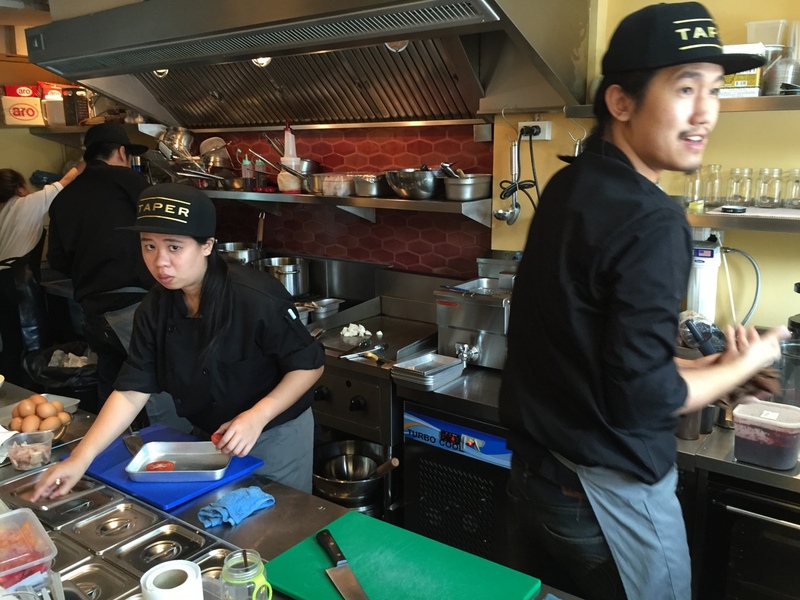 We recently made two trips to Taper, one of the newest brunch restaurants in the Thong Lor neighborhood. Located on Soi Akkaphat, the awkward soi that runs parallel to Thong Lor from Soi 5, across Soi 13, and eventually turns into Soi 17, Taper is neighbors with Little Beast. 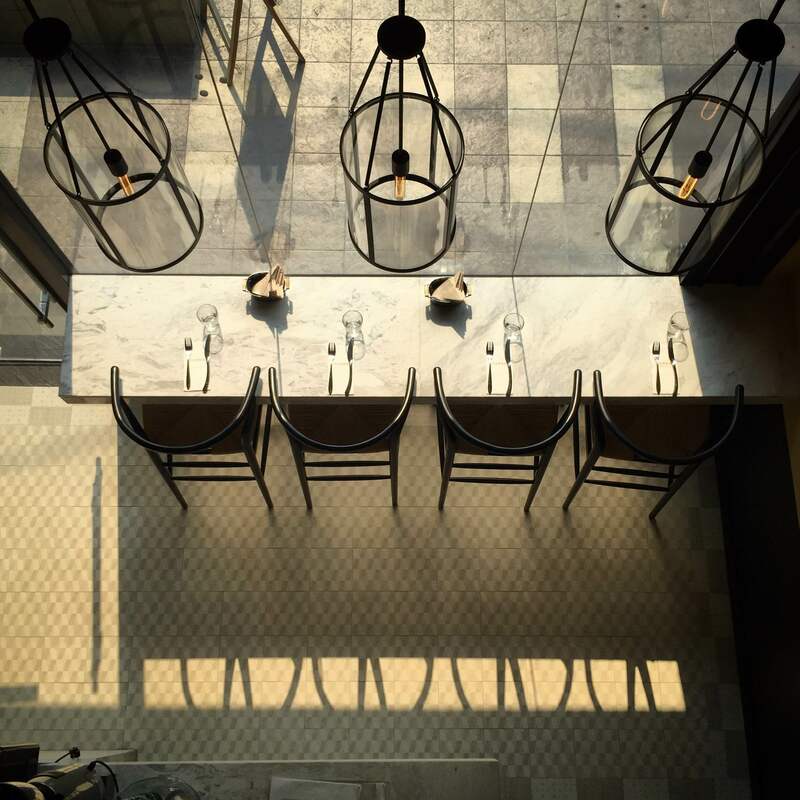 Located on the bottom two floors of a shop house, Taper has a pleasing design with counter seating around an open kitchen on the ground floor, and a more formal dining areas on the mezzanine. The restaurant is a partnership between the two chefs from Le-Du restaurant and a third chef, who was a classmate at the Culinary Institute of America with one of the Le-Du partners. The interior is described as “modern Scandinavian” which would explain why when I first entered, I thought I had walked into a replica of the slightly more elegant Rocket Coffeebar on Sukhumvit Soi 49. The most outstanding point of Taper is the friendly service. From the wait staff to the cooks to the partners, everyone was welcoming and checked in frequently during both our visits to see how we liked the food. Attentive, friendly service is a welcome thing and came across as most sincere. The menu is self-described as “Asian inspired brunch”. 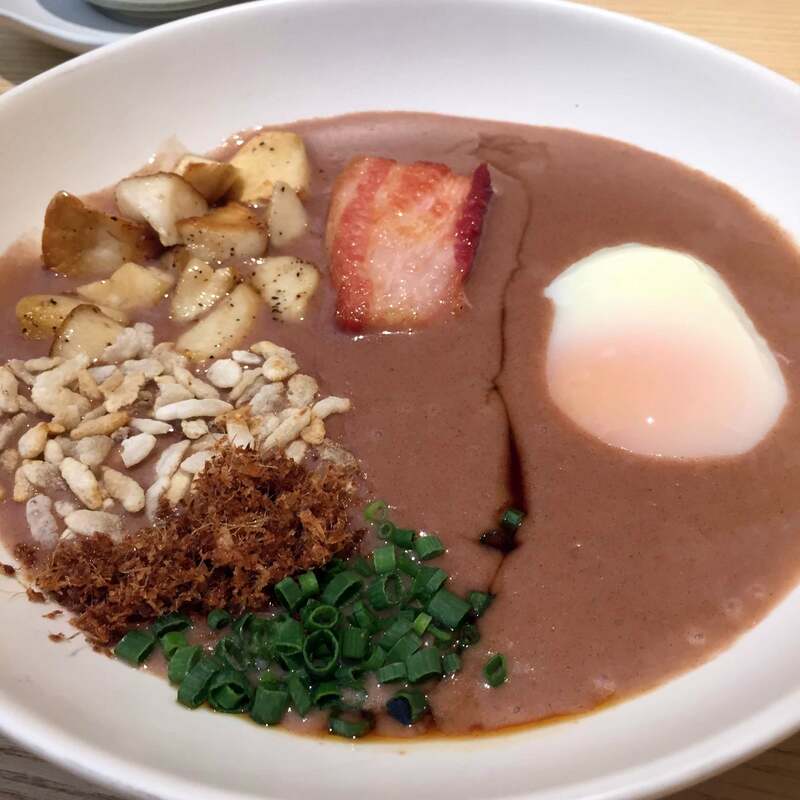 One example of this is their “world famous congee” – brown rice, mushroom, belly bacon, a soft boiled egg, and soy sauce reduction with ginger. What came out wasn’t really congee, but rather a thick blended soup, muddy in color, with a distinctly mushroom flavor. There was nothing particularly wrong with it, but at 330 baht, it wasn’t particularly outstanding, either. 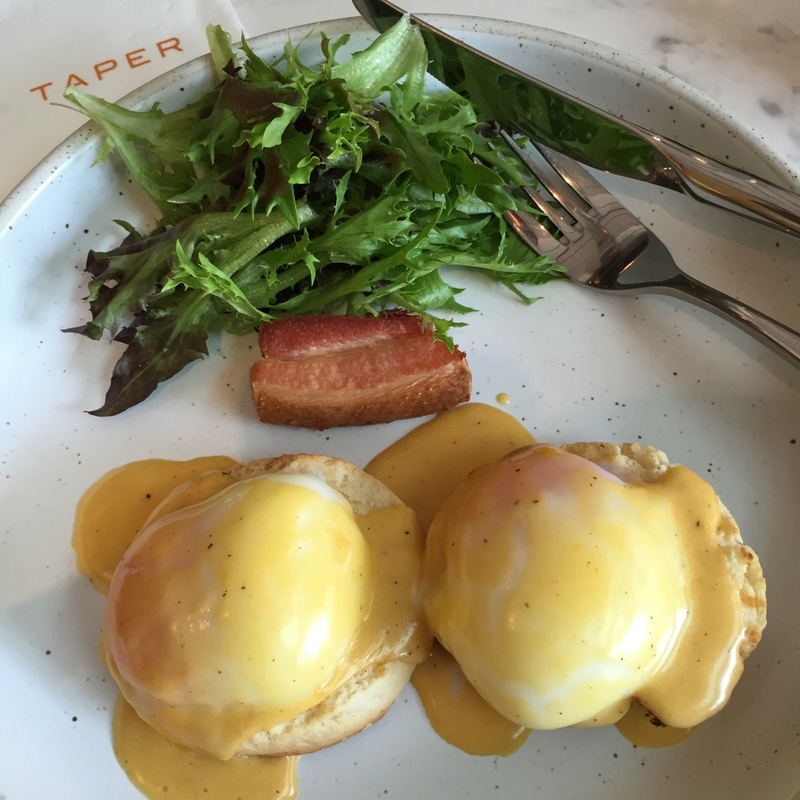 The Taper Benedict is a homemade buttermilk biscuit, so-called “63c” eggs, Hollandaise sauce, “thick cut bacon” (same as the “belly bacon” in the congee), and small rocket salad. The biscuits were nice enough, the sauce was very pleasant (but the surface congealed quickly because of the powerful air conditioner blowing above the kitchen-front counter), but on this visit the eggs had not been poached sufficiently. Let’s not be nit-picky here, but the entire point of a 63-degree egg is that the proteins in the white are set but the yolk is still runny. (See the link above for more.) The whites in my eggs were still the consistency and color of cloudy mucus. I like soft eggs, but these were simply undercooked. The thick cut bacon is such a tiny portion (and tough to cut) that it feels rather stingy. I would rather have two or three slices of regular bacon than to feel, at 290 baht a plate, that I’m getting short-changed. 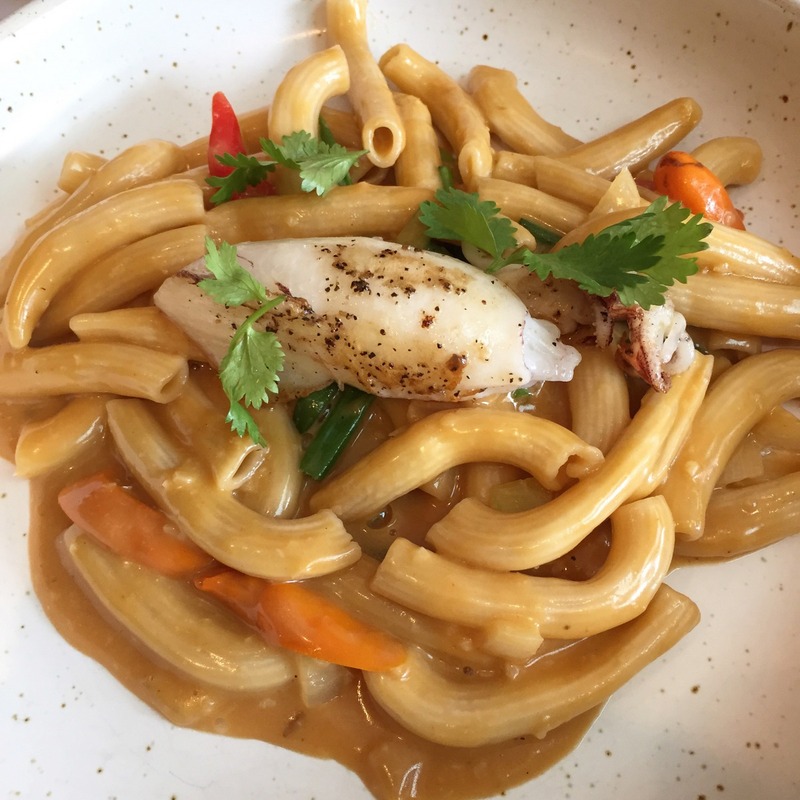 We tried another Asian-inspired dish, the “squid and salty egg”, which was fresh pasta with a sauce made of salted egg yolk served with grilled squid, chili, and coriander. This was a pretty interesting dish, the salted egg yolk giving a different taste than you might usually expect in a pasta sauce. The sauce was gloppy, though. The squid was tasty but being grilled ever so briefly, the texture offered no appealing counter-point to the pasta. Perhaps if it had been pan-fried and was slightly crispy, it would have contrasted better. At 290 baht, this was probably the best value of the four dishes. 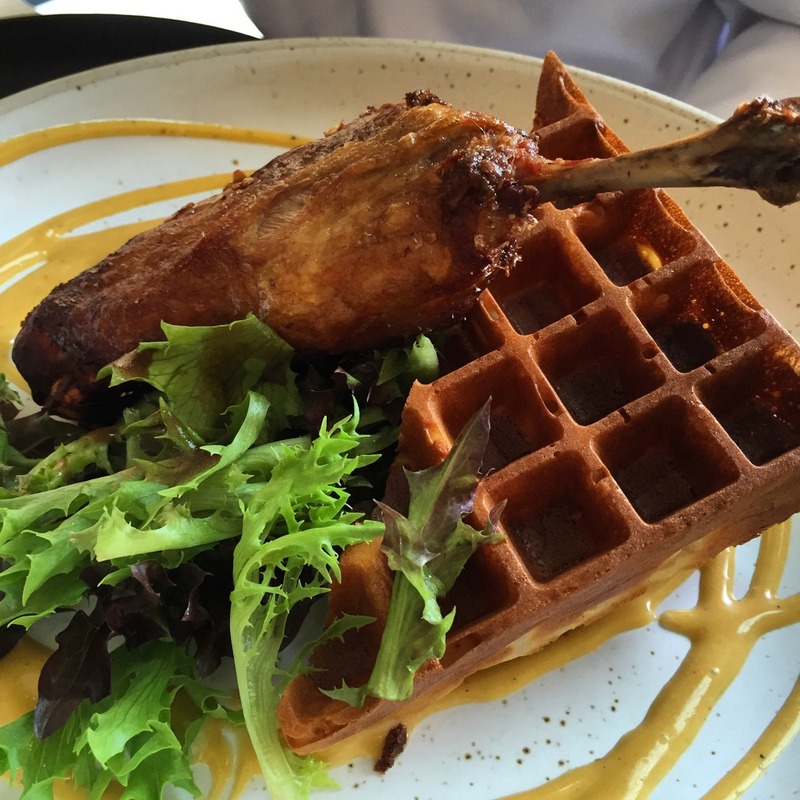 The fourth dish we tried was the duck and waffle, a crispy duck leg, tom yum mayo, buttermilk waffle, and honey butter. This is such a pretty dish and tasted fine, but bits and pieces were underwhelming. The duck didn’t seem to be a proper confit, so the meat was a bit dry and stringy. The waffle was nicely crisp but the tom yum mayo seemed quite thick, the sort of sauce I would turn out (as an amateur cook) from my kitchen. The flavor combination of the mayo mixed with the honey butter was enjoyable, but seemed a bit unsophisticated. The price for this dish was 390 baht, which was okay given what it was. So what to make of Taper? On our two visits we enjoyed the space and the pleasant service. It is clear that a lot of thought has gone into the food and when we spoke with the chef, he seemed genuinely interested in our feedback. The ideas are interesting, but it seems that the execution is still not quite right. The “congee” either needs to be a soup or actually be congee, especially at that price. The sauces need to be a bit more refined. The bacon either needs to be otherworldly or else more generous, portion-wise. The 36-degree eggs need to actually stay in the water long enough to reach 36 degrees. I like what they are doing and want them to succeed, so will probably make another trip or two in the coming month to see if these rough edges get smoothed off. If so, I think Taper will settle into the neighborhood and last. This entry was posted in Food and tagged Bangkok, Brunch, Dining, Restaurant, Taper by christao408. Bookmark the permalink. It’s interesting that the chef was listening to your feedback. I guess it’s easier in an open kitchen or perhaps he came out to chat with the clients. I do like the decor though. Nice review and thanks for posting! Both times, the chef sought us out. Different person both times, actually, as the first time it was the partner (a chef at another restaurant) who was covering while the chef was away. The second time, it was the chef himself. Brunch seems to be latest craze in SE Asia. In SG as well there are so many brunch places opening. A craze I can fully support! Well, there isn’t much to gain by not being honest. I’d like them to succeed – their other restaurant is quite good. If they can fine-tune based on my feedback or the feedback of others, and it helps them survive in a competitive market, all the better! yeah, a new place tends to need time to ‘grow’ and polish up their menu. it seems from your description, their poached eggs not as great as the brunch place you took me once (can’t remember the name). now that was a perfect place for perfectly cooked poached eggs. yum.